2004 was an outstanding vintage, so Settimo made a Riserva with grapes from their Rocche vineyard. 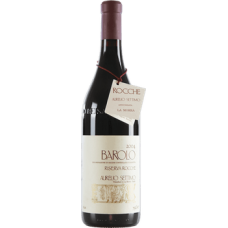 It now shows all the great characters of maturing Barolo, brick to rust red in colour with a powerful bouquet of cherry and plum, with aromas of dried fruit, fig and leather really coming through. Smooth and velvety in the mouth with neat tannins and pleasant acidity in fresh cherry flavours, with notes of tobacco, almond and rose also. Perfect with rich dishes of game and red meat, it should be decanted several hours before serving to allow it to breathe and offer up all its fragrance. 100% Nebbiolo, following traditional methods: lengthy fermentation, 24 months in concrete tanks, and 36 months in big (25-35 hectolitres) French oak casks. No new oak or barrel toast is used.